Last year, after winning two Olympic medals and playing five seasons with the NPF's Chicago Bandits, ace pitcher Jennie Finch retired from softball. But that didn't mean she was moving into the slow lane. In June, Finch gave birth to Diesel, her second son with husband Casey Daigle, a former major league pitcher currently in Triple A. (The couple's first son, Ace, was born in May 2006.) Then in September, Finch announced that she'll be running with a different crowd -- literally. Look for the busy mom on the streets of the Big Apple come Nov. 6, when she'll be tackling the ING New York City Marathon. Working in partnership with Timex, Finch will be the last person to start the race, and for every runner she passes on the course, the watch giant will donate one dollar to the New York Road Runners' youth programs. We caught up with Finch to get the lowdown on her newest venture. espnW: What made you decide to run a marathon? Jennie Finch: It's always been something I've told myself -- "I want to do that one day after I'm done playing." And when Timex approached me about the partnership with the NYRR youth programs, I thought it was such an awesome opportunity. It was a chance to marry a dream and a goal while giving back. So I decided to hit the road running. Does it feel as though you're stepping out of your athletic comfort zone? JF: For sure. 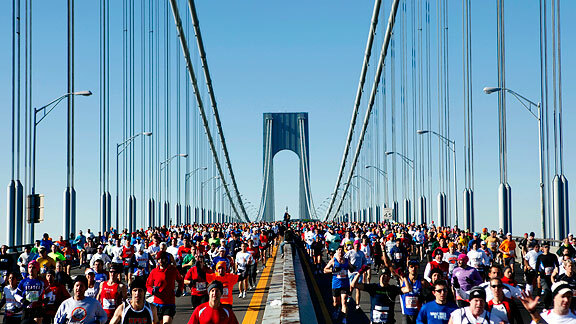 Running is one thing, but running a marathon is a huge feat. I'm excited and looking forward to the challenge. It's great, though -- I'm now focused on the pace, my heart rate and other numbers besides just the time. For softball, running 1.5 miles was often a workout, but now it's my warm-up. I'm also excited to bring those competitive juices back into my life. JF: I've been working with a coach -- Susanne Davis -- who is a triathlete and a mom, so we share the common understanding, mom-to-mom. She's always asking, "Can you squeeze in a workout here, can you push your baby for a three-mile cooldown in the afternoon?" … things like that. And she understands what your body goes through after giving birth. It's been great to have her perspective and her experience. Davis runs Ironmans, which end with a marathon after the 2.4-mile swim and 112-mile bike ride. Does she ever say that a marathon by itself is easy? JF: (Laughs) She hasn't yet. She's been super supportive and sweet. She's actually going to run the marathon with me, so she'll be pushing me along the way. Maybe she'll say that when we're running the race! How did you find the time to train? JF: Well, sleep has been few and far between because of the baby. It's just a matter of whenever I can get it in, let's go for it. Plus, I'm a master at procrastinating, so the earlier the better. How many people are you hoping to pass during the marathon? JF: [Former NFL player] Amani Toomer ran it last year with Timex and he passed over 25,000, so I'm hoping for something in that vicinity. Actually, I'm hoping to beat him, but we'll see. You ran a half-marathon at 20 weeks pregnant. Does that give you confidence you can run a whole marathon when you aren't pregnant? JF: It does, and I didn't train for the half but was able to run the whole thing. This made me think I could do a marathon. But everyone says a marathon is a whole different ballgame. So I'm taking it in stride, and I'm just enjoying the workouts. It's nice to get out and run. Right now my brain tends to get into "mommy mode" -- which makes total sense -- but it's also nice to do something for yourself at the same time. What are you looking forward to at the finish line? JF: Just finishing! Crossing the line and knowing, hopefully, that Timex will be able to donate a lot of money to kids and hopefully inspire them and introduce them to running. The empowerment of running is incredible, and I remember as a young girl, that was just the best feeling -- running around free and having fun. Too many kids are turning away from that now. So I'm excited we can just encourage them to get out and run. The NPF has come a long way since you signed with the Bandits in 2004. What do you think the league needs to do to become even more successful? JF: We just need support. The product is the best of the best. Now it's just a matter of finding the support financially, all across the board. We need to get the word out. Who's your favorite player right now? JF: [Infielder] Natasha Watley. She's my girl. She's amazing! She is just incredible -- she continues to get better and better every year, and yet she is humble and just quietly and calmly goes about her work. She is an international superstar and it's fun to see her. Just when we think she's at her best, she continues to get better. I love her as a friend and as a player. Do you ever play softball anymore? JF: I played in the Legends and Celebrities game this year. But that was the last time since I retired. We also play Wiffle ball with my nephews any time we see them. When Diesel was born, his name generated a lot of attention. How did you feel about that? JF: It is what it is, and people are going to say what they want. Casey and I loved the name and it fits him just perfectly. He's going to be a leader, not a follower. We're just extremely blessed to have two incredible, awesome boys. What's the best piece of parenting advice you've ever received? JF: Just be you. Everyone's different and everyone's family is different. Ace always says, "Every family has different rules." And it's true; do whatever works for you. What sport would you like to try next, after the marathon is over? JF: Get on the beach and play some beach volleyball. Just for fun, though!